Charles Parks was a well known and much loved sculptor familiar to many in the Brandywine Valley area of Delaware and Southeastern Pennsylvania. His works grace public buildings and spaces in the region and across the country. Parks was originally from Virginia, moved to Delaware with his family when he was young, and studied at the Pennsylvania Academy of the Fine Arts in Philadelphia. He produced a body of over 500 sculptures, many of them in his studio in Wilmington overlooking the Brandywine River. The sculptures, primarily cast in bronze, range in size from a few inches to monumental public works almost 40 ft high, such as “Our Lady of Peace”, seen above in progress in his studio, outside the studio and in place in Santa Clara, CA (above, second and third from bottom). I was delighted a few years ago to have the opportunity in my role as a website designer to create a new website for the Charles Parks Studio. In the course of working on the site I had the pleasure of visiting the studio and meeting the artist and his wife, Inge, both completely delightful. Having grown up in Wilmington, I was of course familiar with Parks’ work; it can be found in many public spaces in the city and the state of Delaware, even more so since 2011, when the Charles Parks Foundation donated a large body of work to the state. Parks was a steadfast defender of realism and naturalism in sculpture in the midst of the tides of Modernism that swept through the art world in the mid 20th century. His direct and unpretentious evocations of people, nature and fantasy subjects resonated with the public, and carried forward in many ways the traditions of imaginative realism embodied by the Brandywine School of painters and illustrators. His statue, Boy with Hawk (above, bottom) stands outside the entrance to the Brandywine River Museum in Chadds Ford, PA. There will be a public memorial service tomorrow, Saturday, December 1, 2012 at the Chase Center on the Waterfront in Wilmington, DE. Link: No link - the site has been taken down. Still Life with Flowers and Fruit, Henri Fantin-Latour. In the Metropolitan Museum of Art. Click on Fullscreen and use zoom or download arrow. I’ve written before about the superb series of Superman cartoons done in the 1940’s by the studios of Max and Dave Fleischer. These are beautiful examples of hand drawn animation, essentially film noir adventure stories with great design, rendering and animation; and, as far as I’m concerned, the best film adaptation of the character ever. The cartoons are in the public domain and have been available on the Internet Archive and YouTube for some time in various versions, but they have been remastered from the original negatives by Warner Brothers and recently released on their YouTube channel for all to enjoy. All nine of the original series are linked below. Sometimes I wish that flying from the east coast to the west coast was more convenient; if it was, I might be tempted to fly out to San Francisco just to see this show of small works by two painters I’ve featured previously on Lines and Colors, Erik Tiemens and Terry Miura. 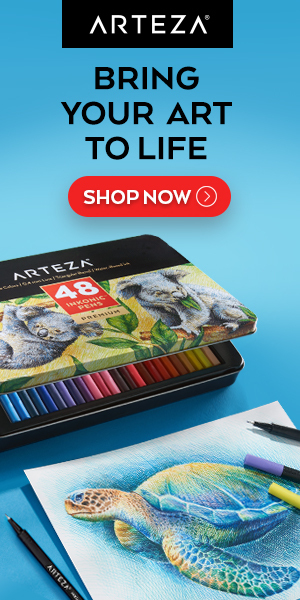 I’ve commented on Tiemens’ beautiful gouache paintings. I also particularly enjoy his obvious enthusiasm for the great landscape painters from the 16th through 19th centuries, and his skillful use of dark tones in landscape, the striking qualities of which are often missed in tendency of many modern landscape painters to draw their inspiration mostly from the French Impressionists forward. Tiemens has recently been working in oil more than in the past. I have to say that I was surprised to read the dimensions on some of his recent small oils, as they appear in reproduction to be larger in scale than they actually are. Terry Miura’s lineage is more directly in the vein of the California landscape painters of the turn of the 20th Century. His vibrant portrayals of the California countryside and seaside are rendered with a painterly economy of notation and keen attention to atmosphere. The show, titled New California Landscapes, is at the Holton Studio Gallery in Emeryville, CA. They gallery has provided a nice Picasa set of included works. Unfortunately, other than that the gallery does a poor job of promoting the show, or the gallery itself for that matter, on their website, which is focused instead on their primary role as frame makers (I will say, however, that the frames look exceptional). There in no dedicated information page about the show or even notice of how long it runs, only a brief mention on the gallery page with a link to the Picasa set. I do know that the show opens this Saturday, December 1, 2012, with a reception for the artists from 4 to 6pm. There is also, to the gallery’s credit, an additional selection of works from both Tiemens and Miura, as they are both represented by the gallery on an ongoing basis. You can find additional images by the artists on their websites and blogs (listed below). Tiemens has highlighted a selection of his work from the show on his blog. The images are linked to even larger versions that show some of the wonderful brushwork and textural qualities in his small oils and the one gouache piece that appears to be in the show (above, fifth down). Miura has featured works from the show in two posts on his blog, here and here, the images for which are also linked to larger versions in which you can see Miura’s crisp paint handling and rich color. In Miura’s images you can also see the custom framing by Tim Holton, that is, according to Miura’s comments, crafted specifically to suit each individual work. Either of these painters would be interesting enough to recommend a show of their work, together this should be a treat. ACME Product Catalog, a Flickr set by Dystopos. 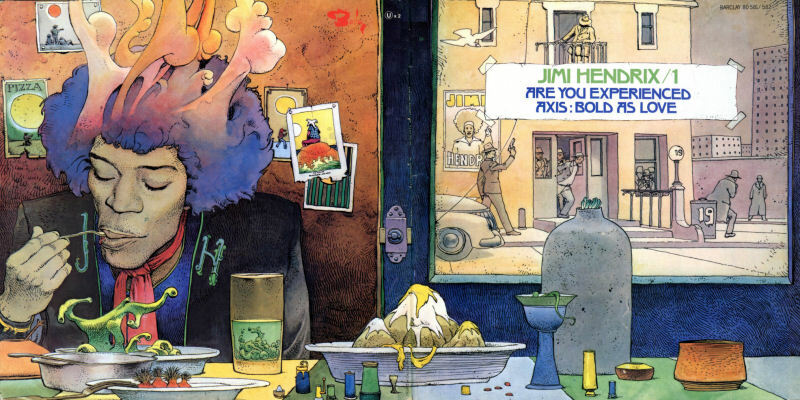 An alternate Jimi Hendrix album cover by Jean Giraud (Moebius), who was fascinated with Hendrix and portrayed him multiple times. Hendrix would have been 70 today.